These days, it's more than reasonable to feel the perpetual urge to detach completely from the real world, and to escape the chaos of it all for some hidden sanctuary where no one -- not even the internet -- can find you. 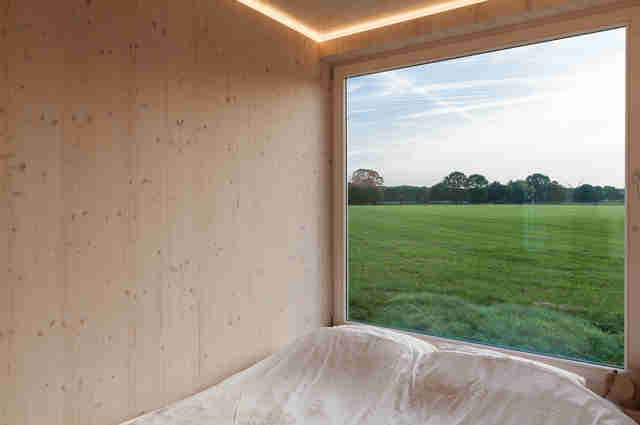 And unless you've secured yourself a room at some hotel in space, an off-the-grid cabin in the countryside is probably your best bet at finding true peace and quiet. 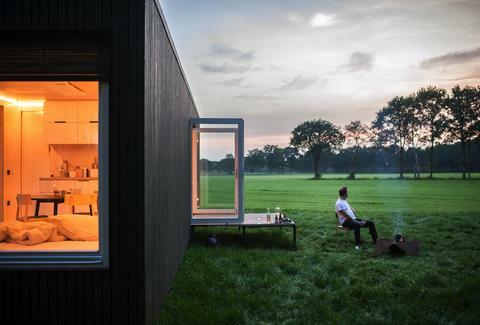 If that's what you're in search of then you'll want to know about Slow Cabins, a network of secluded, rentable off-the-grid mini homes scattered throughout Belgium that are so secret that their exact locations aren't even revealed until you're getting ready to check in. 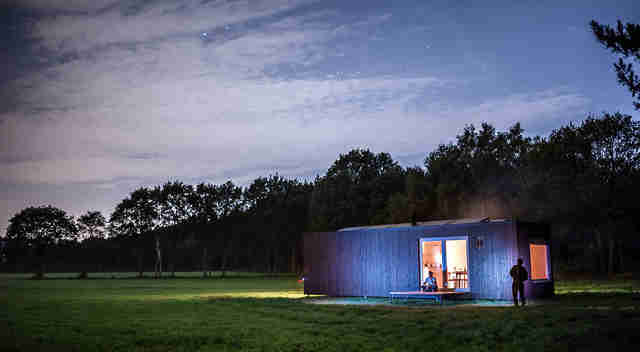 An antidote to the day-to-day madness of the nine-to-five slog and 24-hour news cycle, Slow Cabins offer temporary classy, cozy digs in the middle of nowhere to help you disconnect and relax with complete privacy. And while they're only 430 square feet, each one's fully equipped with all the amenities you'd need for a brief stay. They also vary slightly in terms of layout to accommodate three different types of visitors: couples, families, or colleagues on a work/office retreat. 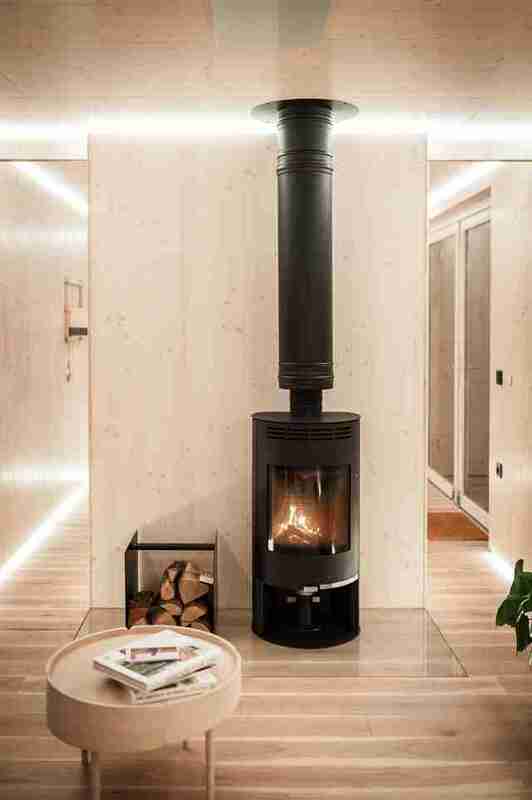 As for the interior, the vibe in each cabin is minimalist and modern, with a lot of clean hardwood surfaces and large windows that make it feel as though you're part of the surrounding landscape. They're also self-sufficient and sustainable thanks to solar panel power, a filtered rainwater system, eco-friendly dry toilet, and a wood-burning stove for heating. For the cooks out there, there's a pair of hot plates, a ceramic BBQ, and a small fridge. If you'd prefer to be find your food elsewhere, each cabin comes with a list of recommendations for (somewhat) local places to grab a meal. You can also request a basket filled with "slow food delicacies" prepared by local farmers to be dropped off if you're afraid to run out of snacks. Each remote retreat is intentionally kept secret up until two weeks before your stay, when you'll be given details of your cabin's exact location so you can plan accordingly. If you're up for it and feel like schlepping to Europe for a true getaway, there's a two-night minimum when you book a couple or family stays, which will cost you $210 and $222 per night, respectively. For a work-centric cabin setup (appointed more like an office) for just an afternoon, that'll set you back $355. For now, Slow Cabin only offers accommodations in Belgium, but they are planning to expand across parts of Europe, so stay tuned.